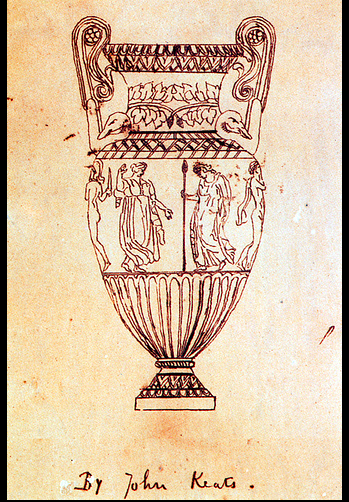 When the poet, John Keats, wrote the line, “Thou foster child of silence and slow time”, he was talking about a Grecian urn. http://www.bartleby.com/101/625.html The urn had survived from the days of ancient Greece and the figures depicted on it were a freeze shot of life in that time: a boy and girl almost kissing, a garlanded cow being paraded off to be sacrificed. Keats expresses envy for these happy people immortalized in their joy. He seems to have written it in May 1819. In 1820, he was diagnosed with consumption or tuberculosis, probably contracted when he took care of his brother, Tom, who died of the disease. Keats died at the age of 25. But the line keeps recurring in my head here on the mountain. In my last post I talked about sitting still on a rock beside a pond for over an hour, watching and listening to the coots and ducks and red wing black birds, studying the stone itself, the reeds and the water. After 9 a.m., the birds, who started their serenades around 5, begin to fall silent in the heat with the notable exception of flights of angry red wings after the thieving hawk. As the heat grows, the silence deepens, although from time to time, the breeze rises and the pines begin to purr. The sound will start off down the road and gradually arrive, cooling as it comes. To me it is the most comforting sound in the world. The village goes by mountain time. Workmen here are even harder to pin down than in the city. The plumber may be a plumber some days. On others he may be a painter, layering oil colours on canvas. The pellet stove repair guy may not regard your emergency as one. Things move slowly here. I have been nagging myself because I’m no longer filling my days with useful tasks, Then yesterday, I found myself sitting and staring and realized I was just on mountain time. Mountain time sounds wonderful…..and I suppose that someone must take up the mantle of ‘silence and slow time’…..but in this village on city time we’re still saving a place for you. I’ll be back to fill that place eventually. I do hope so……the spiritual mojo of this village on city time gets all dis-com-bob-u-lated when you are absent for so long!! But we will carry on as best we can in light of the most important work you are doing! I hope it’s inportant. Thanks.